Pat McCabe is a versatile young back who looks set to enjoy a long and fruitful career with the Wallabies. A member of the New South Wales academy, McCabe underlined his promise with some eye-catching displays for Australia in the Under-19 World Championships in Belfast in 2007. He was taken on by the Brumbies academy two years later and, after impressing on a development tour to France later which featured several senior players, he signed a full contract with the franchise for 2010. His performances during the 2010 Super Rugby season earned him a place in the Wallabies squad for the Tri-Nations. McCabe did not see any game time but was included in panel for the end-of-year tour nonetheless. 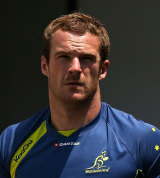 McCabe earned his first Wallabies cap from the bench against Italy in November 2010 and following an impressive 2011 Super Rugby campaign started for the Wallabies against Samoa in July 2011. Despite the high profile loss to their Islander rivals, McCabe stayed in the Wallabies mix and started three of their Tri-Nations matches. He must have done enough to impress boss Robbie Deans as he was rewarded with a spot in the Australia squad for the 2011 World Cup.